← What is a Permanent Document? 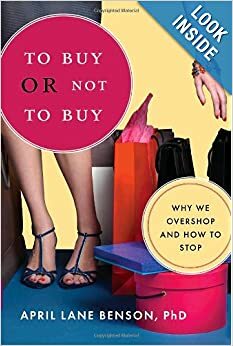 I just started reading To Buy or Not To Buy: Why We Overshop and How to Stop by April lane Benson, PhD. It looks like an interesting read. Dr. Benson starts the conversation with her eleven categories of overshoppers. You shop to feel better about yourself or more secure. You shop to avoid dealing with something important. You use shopping as a weapon, to express anger or seek revenge. You shop to hold on to love. You shop to soothe yourself or repair your mood. You shop to project an image of wealth and power. You shop to fit into an appearance-obsessed society. You shop in response to stress, loss, or trauma. You shop because it’s the lesser evil. You shop to feel more in control. You shop to find meaning in your life or to deny death. Interesting list. I think I have met people from each category. Reading just this short portion of the book made me wonder about my shopping habits. I look forward to reading the rest of the book. This entry was posted in Uncategorized and tagged Inspiration, Shopping. Bookmark the permalink.